The world is hungry for every scrap of Star Wars 8 news it can find and the production itself is locked down from top to bottom with leak countermeasures. In an interview to promote his new Mark Hamill's Pop Culture Quest YouTube series, the Luke Skywalker actor told Polygon that working on the movie is like "working for the CIA". "You get your pages in the morning, and they take them from you as you walk so they can shred them before it somehow leaks," Hamill said. "You have security lines you have to walk through, both to and from set. And, not to mention, you have to wear these big monk hoods to protect your costume from drones." Luke's appearance at the end of Star Wars: The Force Awakens managed to remain (mostly) a secret, which meant the pressure wasn't quite as intense for the actor. 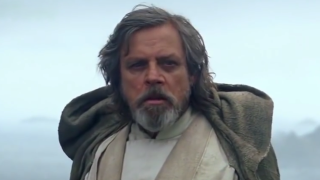 But Hamill's much-anticipated role in Star Wars 8 means he really has to watch his tongue now. "I will say this. I was really surprised to see how strongly people reacted to my participation in Episode 7, and now with 8, they’re so incredibly strict that unfortunately I can’t say anything," Hamill said.